The ultra-quiet cooling fan can be positioned to stand upright or laid flat to cool various electronics and components. Features a multi-speed controller with power switch. Includes eight large anti-vibration rubber feet and a 6-foot power cord. 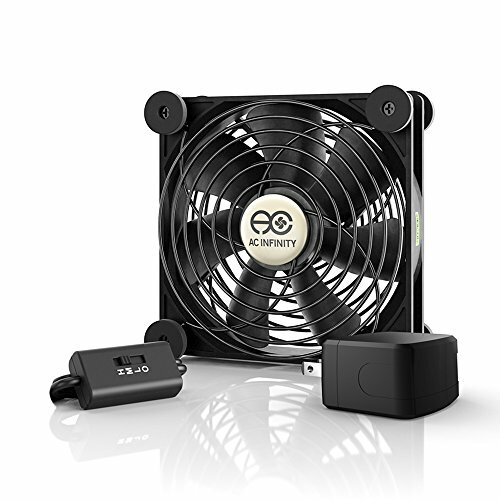 The included turbo power adapter increases the fan's RPM by 25% and boosts CFM ratings for higher airflow. The adapter also enables the fan to be powered through a standard wall outlet. Each unit contains an USB port, up to six fans can be daisy chained together to share the same AC power source. Certified by CE, UL, TUV, and RoHS.